Both Samsung and Huawei have mostly managed to keep their foldable smartphones under wraps before launch. However, a render of the Samsung Galaxy Fold appeared online a day before its launch, and now, an image of Huawei’s first foldable smartphone has been leaked online. 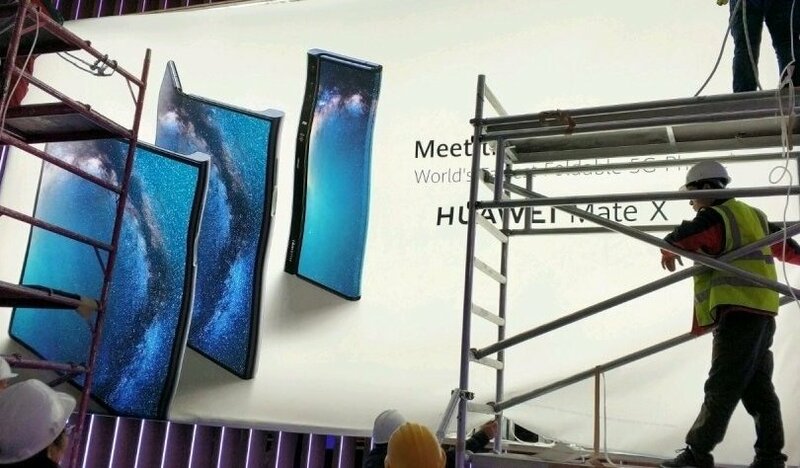 According to the leaked image, which seems to have been snapped at Huawei’s Mobile World Congress press event venue during preparation, Huawei’s foldable device will be called the Huawei Mate X. The image was first posted on Chinese social media and then made its way over to leak aggregator SlashLeaks. Although we don’t know how the source obtained the image, the image does seem legitimate. The image shows several people in construction gear putting up a large poster teasing the device. The image is low resolution and the poster itself isn’t flat likely because it was still in the process of being put up (you can tell by looking at the top). However, we can still make out the text that states “world’s fastest foldable 5G phone” and “Huawei Mate X.” The device appears to have a side-mounted fingerprint scanner and a triple camera setup. Unlike the Samsung Galaxy Fold, the Huawei Mate X does not seem to have a cover display. I will refrain from further speculation about the device since we will hear more about it soon, but I’m interested in seeing if Huawei’s approach to the foldable smartphone will win out over Samsung’s approach.